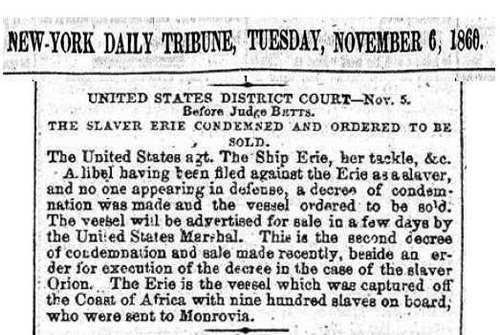 December 5, 1860, the slave ship ERIE was sold at government auction in Atlantic Basin, Red Hook, Brooklyn, One month prior, the ship had been condemned and ordered to be sold by the United States District Court. This was news of national note -- and is an important event in African American history. The following is designed as a glimpse into the complex subject of slave ships and slavery. Below we offer some information and links to encourage you to explore the often misunderstood history of slavery in the USA, which minimizes the North's dependence on slavery and its racism against blacks. 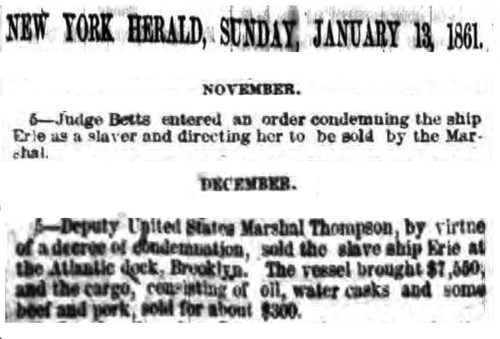 New York City, Brooklyn (a separate city from Manhattan at that time) and the maritime industry were heavily involved in and dependant on slavery. We ourselves are in the process of conducting more research into the maritime end of the slavery story, and if you want to share some information or get involved, reach out to us via our webpage CONTACT. 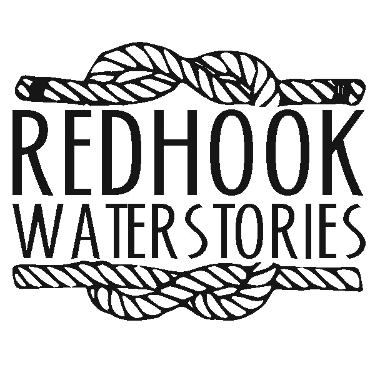 Note that Atlantic Basin, Red Hook earlier in its history was known as the Atlantic Docks. Hanging Captain Gordon, by Ron Soodalter, 2006. A reviewer on Amazon writes: "Soodalter, a former museum curator and history teacher, uses this singular event as a prism to provide an overview of Civil War-era politics, Lincoln's presidency and the maritime economy of slavery." Do not flatter yourself that because they belonged to a different race from yourself, your guilt is therefore lessened – rather fear that it is increased. In the just and generous heart, the humble and the weak inspire compassion, and call for pity and forbearance. As you are soon to pass into the presence of that God of the black man as well as the white man, who is no respecter of persons, do not indulge for a moment the thought that he hears with indifference the cry of the humblest of his children. Do not imagine that because others shared in the guilt of this enterprise, yours, is thereby diminished; but remember the awful admonition of your Bible, “Though hand joined in hand, the wicked shall not go unpunished." — Worcester Aegis and Transcript; December 7, 1861; pg. 1, col. 6. 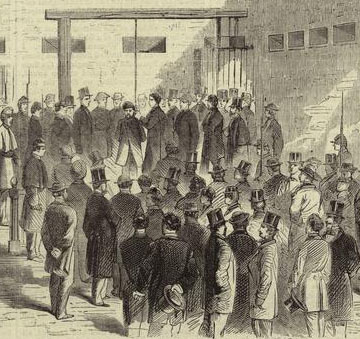 Since 1820, the importation of people as slaves had been illegal in the U.S. and punishable by death but it was not but until November 1861 when Nathaniel Gordon was hanged that the full force of the law was carried out. There had been 74 cases between 1837 and 1860 but few were convicted and those who were received only light sentences. President James Buchanan, in 1857, pardoned the one previous slave trader sentenced to death. President Abraham Lincoln received pleas for clemency for Nathaniel Gordon but refused. A February 4, 1862 letter, in the Gilder Lehrman Collection, grants Gordon a bit more time to get his affairs in order, but no more. A book about the Northern role in slavery “Complicity: How the North Promoted, Prolonged, and Profited from Slavery” has a lot of information related to New York City, the history of slavery here, of racism against blacks, of the city's economic dependance on slavery in the South to the point that a Civil War-era Mayor of NYC wanted to succeed from the Union because the end of slavery would be such a blow to NYC's economy. The book is the work of three journalists from the Hartford Courant and uses several themes to reveal how the North supported and profited from slavery, from colonial times until, and even after, the Civil War. It also reveals the long history of racism against African Americans in the North. “Slavery in New York” edited by Ira Berlin and Leslie M. Harris, published in conjunction with the New-York Historical Society, 2005. The maritime might of the northeast, its shipbuilding, ports, and seafarers meant that the North was hugely involved in direct and indirect aspects of slavery. A new museum is being planned by the Episcopal Church in Rhode Island to capture the history of the North’s involvement in slavery, the role of the Episcopal Church, and foster racial reconciliation and healing.